The Ace of Swords shows a gleaming hand appearing from a white cloud, a representation of the Divine. 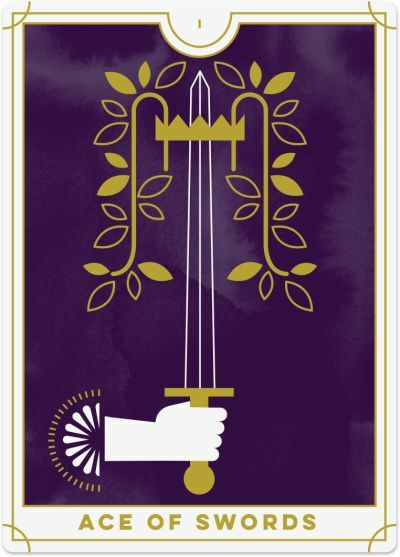 It holds an upright sword, symbolic of the mind and the intellect, and at the tip of the sword sits a crown draped with a wreath, a sign of success and victory. While this Ace is a sign of triumph, the jagged mountains in the background suggest that the road ahead will be challenging. You will need mental resilience to navigate this path. The Ace of Swords marks a wave of new energy from the intellectual realms. You may be on the verge of a significant breakthrough or a new way of thinking that allows you to view the world with clear eyes. Or, you may have a sudden realisation or conscious understanding about an issue that has been troubling you and can finally see the path ahead of you. Meditate regularly to clear away the mental chatter and make the most of this intellectual potential. See this card as a sign of encouragement. It says your mind is in 'expansion mode’. You are open to embracing new ideas, craving stimulation, and you’ll jump at the next opportunity to learn something new. You thrive on new ideas, inspiration, original thinking and vision, and you are excited to pursue new opportunities that draw upon your creative and intellectual abilities. 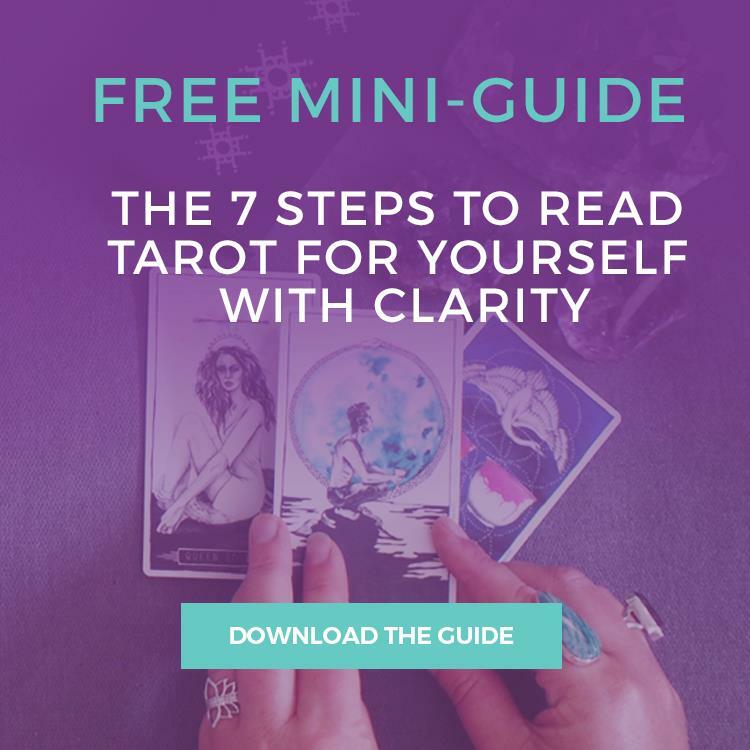 When the Ace of Swords appears in a Tarot reading, it tells you that now is an excellent time to start a new project – one that requires your intellect, communication skills and mental power. You may feel inspired to take a writing class, practice your public speaking skills, or get involved in activities that require more brainpower than usual. How might you draw on this Ace's motivation and take action on your new ideas? As an Ace, you are at the beginning of the journey, but you can sense the energy building up and can’t wait to get started. If you channel this energy into the right moves, then you will succeed in your endeavours. Just remember that the road ahead may be bumpy and you can expect challenges along the way. Maintain a success mindset, and you will navigate these hurdles with ease. As with all Swords cards, the Ace of Swords represents power; but the sword is a double-edged blade, implying that it can create and destroy. The message is clear: with power comes responsibility. It will be up to you how you leverage the opportunity for the greater good of all rather than for selfish or aggressive power. You will need a strong heart and mind and need to see how to best use your power for the service of others and yourself. The Ace of Swords also encourages you to pursue the truth of the matter and to find justice. You may champion a cause or stand up for your rights or the rights of others. Or, you may have a new idea for which you are prepared to fight, or you may feel fired up about an issue you are passionate about, such as human rights. You have great clarity on the situation and can now argue your point of view with truth and conviction. In other words, you are ready for battle. The Ace of Swords reversed indicates that a new idea or breakthrough is emerging from within you, but you are not willing to share it with others just yet. You may still be exploring what this idea means for you and how to best express and manifest it in the external world. You may also seek greater clarity about whether this is an idea you wish to pursue more fully, perhaps because you are unsure if it will bring the results you truly desire. When this card appears in a Tarot reading, it’s important to give yourself time and space to meditate and clear your mind so you can ‘birth’ this idea in the most effective way. Sometimes, the reversed Ace of Swords can be a signal you have an idea that’s not coming to fruition in the way you had hoped, and it’s time to go back to the drawing board. You may still be pursuing an idea that no longer has any meaning for you. Or you may have too many ideas on the go, and you cannot commit to one course of action. This card invites you to spend more time on defining in plain terms what it is you want in life. Set yourself some SMART goals (specific, measurable, achievable, realistic and time-bound) so you can be clear on what you are working towards. Focus on the basics and do some better planning. Get clear on your aspirations and goals. The Ace of Swords reversed can also suggest clouded judgement and lack of mental clarity around a specific situation. You are missing relevant information or evidence that will help you decide, so invest your time and energy into seeking out the truth rather than just taking things at face value.